Lightly roast split chick peas (pottu kadalai) in a non-stick sauce pan. You don't need to add oil or butter. Grind to a fine powder in a blender. Add fresh grated Coconut to the blender. If you buy frozen coconut, then take 1 cup of frozen grated coconut in a microwave safe dish and zap for 30 seconds. This will soften the coconut and you may now transfer this to the blender. To this, add chillies, coriander and 1/2 cup of water. Grind all this together in the blender for about 30 seconds. Intermittently stir contents to ensure uniform blending. Grind again for about 30 seconds . Now add 1/2 cup yoghurt in blender and grind mixture for about 15 seconds. Ensure the mixture is still somewhat grainy, but not overly so. Set aside in serving bowl. Add salt and lightly stir. You are almost done. Add olive oil in sauce pan and place on medium heat. When the oil is hot add mustard seeds, red chilli and hing. In a few seconds the mustard seeds will pop. Add curry leaves and turn off stove. 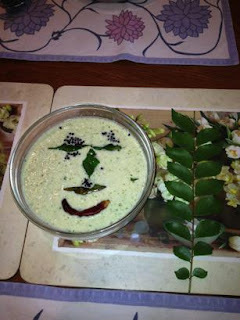 In about 30 secs transfer this to the serving bowl as garnish for your Coconut Chutney..